Torchwood. Outside the government, beyond the police. Tracking down alien life on Earth, and arming the human race against the future. The Twenty-First Century is when it all changes, and you've got to be ready. Torchwood: Miracle Day will be premiering on the Starz Network on Friday! This series is a continuation of the BBC series, and while I'm sure great care will be given to make the show accessible for those joining us for the first time, I wrote this for any newbies who would like to know what's come before, and any old fans who might want to refresh their memories. Seriously, though... if you have Netflix, the whole series is available to stream there. So why not just stop reading now and go watch it? I won't be hurt. Torchwood is a spin-off of Doctor Who, and basically was marketed as a more "adult" sci-fi.. The fictional Torchwood was established in the late 1800's by Queen Victoria who, after meeting the Doctor, formed an agency to defend the earth against extraterrestrial threats... the biggest known threat being the Doctor himself, whom Queen Victoria had declared an enemy of the state. The Doctor didn't know of Torchwood's existence until 2007, when he traced a disturbance to their secret tower. Torchwood had inadvertantly opened a portal to a parallel dimension and an covert alien invasion was in progress. The Doctor thwarted the invasion, and in the process hundreds of Torchwood personnel were killed, and the main branch was closed. 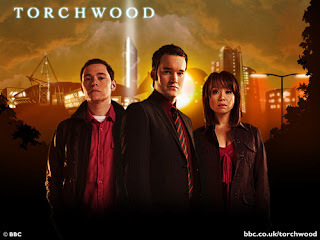 The Torchwood series picks up with a much smaller branch (Torchwood 3) having moved into the Torchwood Tower to continue monitoring the Hellmouth Rift, as it has made the city of Cardiff a magnet for all types of weirdness. 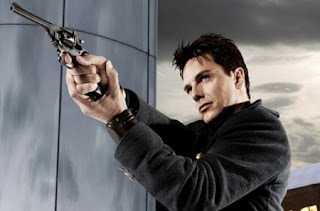 Captain Jack Harkness - Leader of Torchwood Three, already known to Doctor Who fans at the start of the series. Captain Jack was a former "time agent" from the 51st century. Fans hadn't seen him in over a year when this series began... he had last been seen in the far off future, in an episode where he was killed and brought back to life by the Time Vortex, and then forgotten by his travelling buddies in the chaos of the "death" of the ninth doctor. As we catch up with him here, we learn that as a result of the previous adventure, he is now immortal. And not too happy about it. We eventually learn that upon discovering his condition, he tried to travel back in time to consult the Doctor, but overshot and ended up in the late 1800's, with his time travel machine damaged. When Torchwood caught wind of a man who couldn't die, he was less-than-willingly recruited into their organization. At the start of the series, Captain Jack is still trying to catch up with the Doctor. Gwen Cooper - Torchwood's "police liason", recruited in the first episode. Shown with her is Rhys. Rhys was Gwen's boyfriend as the show began, and completely in the dark about what Gwen did. In the second season, Gwen decides the secrets are ruining their relationship, and spills everything to Rhys. The two are married in the second season. In the Children of Earth miniseries, Rhys actively assisted the team, but has never officially been a member. The series starts with Gwen Cooper, police officer, spying on Torchwood conducting a murder investigation she's involved in. She watches them use a device to bring the murder victim back to life. She tries to sneak into Torchwood, but discovers she's been expected. They show her around, but give her an amnesia pill. Well, one of the members has turned to the darkside. Gwen continues her investigation which leads her to one of Torchwood's members, Suzie. Jack catches Suzie trying to kill Gwen, and Suzie ends up taking her own life. Gwen recovers her memories in the process, and Jack decides to offer her a spot with Torchwood. The first season is more episodic than what's to come. I think you can pretty much watch every episode between first and last without being lost. In the final episode, relationships formed over the first season are used to manipulate the Torchwood members into opening the rift and releasing Abaddon, a demon who threatened to destroy the world by absorbing the life-force of anyone who it came in contact with. Jack realized that since he cannot die, feeding off his life could be bad for Abaddon, and the plan does end up killing Abaddon, and apparently Jack as well. Jack does wake up a few days later, and becomes aware that the Doctor is nearby and goes chasing after him. Jack returns after missing (having made guest appearances on Doctor Who in the interim) for several months. On his return, a former time agent and friend of Jack's named Captain John Hart (played by John Marsters, best know to geeks for playing Spike in Buffy the Vampire Slayer, and Braniac in Smallville) has found Jack. He's actually on the run from someone trying to kill him, and is willing to sacrifice the lives of Jack's friends to save his own. At the end, John flees, but leaves Jack visibly shaken when he tells Jack that he's found "Gray". Later in the season, we discover that Gray is Jack's little brother, whom Jack was supposed to watch during an evacuation of his planet during an alien invasion, but the two were separated. Mid-season, tragedy strikes as Owen is killed. Jack uses a resurrection glove to allow the team to say goodbye to Owen (a device which brings a person back to life for a couple of minutes). But then... Owen doesn't die. But he's not fully alive, either. He doesn't breathe, can't eat, and his wounds don't heal. Owen laments that while Jack is going to live forever, Owen is going to die forever. In the season finale, John returns and captures Jack and delivers him to his brother Gray, who holds a grudge against Jack. John and Gray bury Jack in a secret location for all eternity, but John leaves Jack with a ring that will allow Torchwood to find him. Jack escapes and tries to get Gray to forgive him, but ends up sedating Gray and putting him in a cryogenic freeze. In the meantime, a nearby power plant is going into meltdown as a result of bombs that Gray had detonated throughout the city. Owen is able to vent the radioactive waste, but his body is consumed in the process, finally granting him peace. Toshiko, herself bleeding out from a gunshot wound delivered by Gray, talks Owen through his last moments. 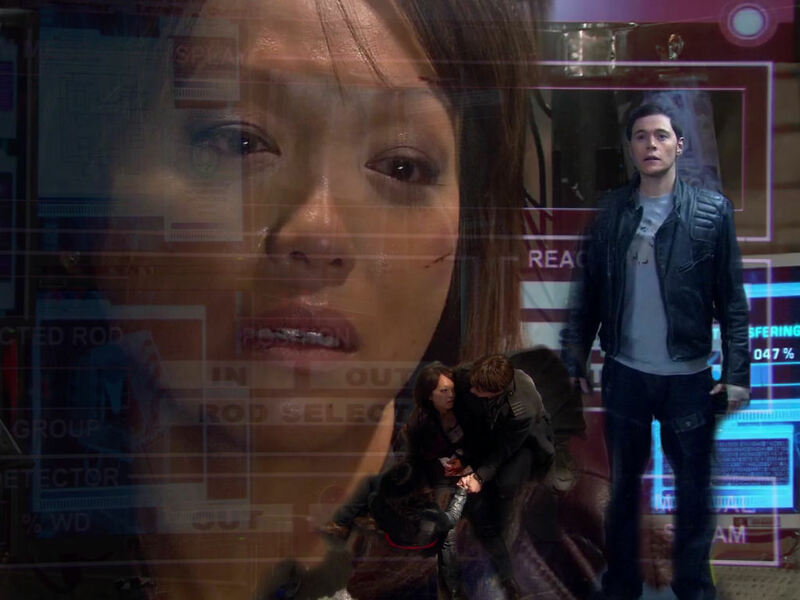 The rest of Torchwood finds Toshiko moments before her own death. The season ends with the team finding a message Toshiko left to them in the event of her death. Torchwood, down to three members, resolves to press on. "So if you're seeing this I guess it means I'm, well, dead. I hope it was impressive, not crossing the road or an incident with a toaster. I just wanted to say, it's okay. It really is. Jack, you saved me. You showed me all the wonders of the universe and all those possibilities and I wouldn't have missed it for the world. Thank you. And Owen, you never knew. I love you, all of you. And I hope I did good." The depleted Torchwood team appears in the huge Doctor Who season final the following year. They use the rift to help send a message to the Doctor when the Earth is hidden away to allow the Daleks to invade. Jack joins the Doctor to overcome the Daleks, while Ianto and Gwen have to trap themselves in Torchwood, using a timelock to stop a Dalek invader. Rather than do a full season in 2009, the show returned for a five-night miniseries. So all the children on Earth suddenly start simultaneously saying "they are coming". Some British officials tie it to some aliens called the '456' that they encountered about fifty years ago, an encounter that Captain Jack was involved with... and decide that Jack is a liability, and that they might as well be thorough and take out all of Torchwood. They manage to incapacitate Jack and plant a bomb in his stomach without him knowing. Fortunately, upon returning to torchwood, he's suspected that Gwen is pregnant, and after running a scan on her to confirm, he decides to... do a pregnancy on himself as well, I guess. Which is fortunate, because his bundle of joy has just about come to term. 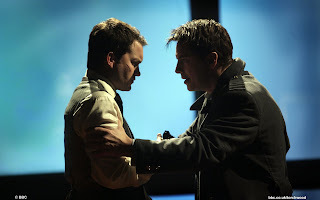 He evactuates Ianto and Gwen and allows Torchwood to absorb the blast. The government continues to be thorough and collects the pieces of Jack, and wisely so, since his body immediately begins rebuilding itself in a gory, painful way. Meanwhile Torchwood, and by association, Rhys, are on the run. A conscientious worker inside the government reaches out to them and helps them break Jack out, while following up a lead about a single adult that's also affected when the children started talking in unison. The man is revealed to be one of a group of children that Jack handed over to the 456 decades before to prevent an unwinnable ware, and when the British government reaches out to the aliens, they aliens state that they want more children... ten percent of the children of earth, to be exact. Jack and Ianto confront the aliens, who respond by locking everyone in the building their in and releasing a toxic virus, killing everyone inside. Except Jack, of course, trapped with Ianto, who has become his lover over the course of the series, forced to watch him die. "A thousand years time? You won't remember me." "Yes, I will. I promise. I will." The governments of Earth begin making arrangements to try to deliver the children to the aliens before the adults can figure out what's going on. Rhys and Gwen go to Ianto's family to try to protect his family, and end up trying to protect all the children in the neighborhood from being captured by the government soldiers. Jack works with the government, who has brought in his daughter and grandson, to find a way to stop the 456. They realize they can send a signal that would harm the aliens back at them, but they would need a child to use as a focal point, and that child would be killed in the process. And with no time left to stop them, there's only one child close enough to use... Jack's own grandson. Jack sacrifices his grandson to save the Earth, as his daughter watches on horrified. We pick up six months later, with a very pregant Gwen and Rhys meeting up with Jack. Jack is still devastated over all the death that has occurred, and decides it's time to leave earth. While this is the last we've seen of Torchwood leading into Miracle Day, Jack shows up one more time in Doctor Who. The Doctor, in a terminal state, goes and visits his friends one last time before he regenerates into his new form. Jack is drinking his sorrows away in an alien bar, and receives a note from "that man over there". It's the name of the soldier sitting next to him, and Jack, who never could resist a man in uniform, uses the information to strike up a conversation. So there it is. Jack and Gwen (with Rhys in tow) return when Torchwood: Miracle Day debuts on Starz on Friday, and if you miss it, you'll still have about 137 chances over the coming week to catch a replay. Starz, in the past, has also delivered its original shows to Netflix in short order, so it may be available to stream sooner rather than later. Which reminds me, I still haven't watched any of the new season of True Blood yet. What's wrong with me? Oh, speaking of vampires and Dr Who... the remake of Fright Night starring David Tennant hits theaters on 8/19! My friend is trying his best to get me to watch Torchwood, problem is, I'm not at all interested. Only thing that caught my eye was that it's on Starz and aside from the putrid Camelot, they've done an awesome job with most of their shows.